In this section you will find information regarding bank deposit figures for bank branches for Hilton Head Island and Bluffton as well as Department of Transportation data related to traffic volume in the region. Provided by the South Carolina Department of Commerce. In this section, independent financial audits for the Hilton Head Island-Bluffton Chamber of Commerce are available to view for the last 10 fiscal years: 2009, 2010, 2011, 2012, 2013, 2014, 2015, 2016, 2017, 2018. View the presentation with Demming Bass from the June 19 Tech Tuesday. This report contains population, unemployment rate, and per capita income for Beaufort County for the month of June 2018. Click here to get the presentations from the May In the Know series. This report contains population, unemployment rate, and per capita income for Beaufort County for the month of May 2018. This report contains population, unemployment rate, and per capita income for Beaufort County for the month of April 2018. This report includes the Small business Index as provided by the U.S. Chamber of Commerce. This report contains population, unemployment rate, and per capita income for Beaufort County for the month of March 2018. This section includes information shared at the Wexford Plantation Workforce Dinner on March 2, 2018. Key topics include: workforce housing, transportation and community impact. This section includes the presentation made by Mike Kosdrosky, Executive Director Aspen/Pitkin County Housing Authority (APCHA) at the 2018 UNITE Summit. This section contains the opening presentation as made by Bill Miles, President & CEO of the Hilton Head Island-Bluffton Chamber of Commerce. This section contains the presentation from Jeff Lungren, Chief Health Care and Immigration Lobbyist, Executive Director, U.S. Chamber of Commerce. This section contains the presentations for Jason Peasley, Executive Director, Yampa Valley Housing Authoriy; Paul D'Angelo, Housing Development Specialist, City of Asheville; and Evelyn Dobson, Executive Director of the Community Land Trust, Delray Beach, FL from the UNITE Workforce Summit. This section contains the presentation made by John O'Toole, Beaufort County Economic Development Corporation at the UNITE Workforce Summit. This section contains presentations made by Clark Jackson, Manager, U.S. Chamber of Commerce, SE Region and Allie Velleca, Specialist, National Transportation Demand Management, AECom. This section contains the presentation made by John Salazar, Ph.D. from the UNITE Workforce Summit on February 28, 2018. This report contains population, unemployment rate, and per capita income for Beaufort County for the month of February 2018. This report contains population, unemployment rate, and per capita income for Beaufort County for the month of January 2018. This report contains population, unemployment rate, and per capita income for Beaufort County for the month of December 2017. This report contains population, unemployment rate, and per capita income for Beaufort County for the month of November 2017. This report contains population, unemployment rate, and per capita income for Beaufort County for the month of April 2017. This section includes the Beaufort County Community Profile from from 2015-2016 and 2016-2017. This report contains population, unemployment rate, and per capita income for Beaufort County for the month of March 2017. This section includes a selected list of companies as compiled by the South Carolina Department of Commerce based on business databases, company web sites, and Department of Commerce information. This report contains population, unemployment rate, and per capita income for Beaufort County for the month of February 2017. This section includes information on the United States employment rate for January 2017. This section includes information on the United States employment rate for December 2016. This report contains population, unemployment rate, and per capita income for Beaufort County for the month of January 2017. This section shows the airlines currently providing air service to Savannah Hilton Head Island International Airport. This section provides comparison data year over year for employees in selected industry sectors. This section contains the Regional and State Employment and Unemployment Statistics for the month of November. This section includes information on the United States employment rate for November 2016. This section contains the Regional and State Employment and Unemployment Statistics for the month of October. This report contains population, unemployment rate, and per capita income for Beaufort County for the month of November 2016. This section includes information on the United States employment rate for October 2016. This section includes information relating to the Regional and State Employment and Unemployment based on data received by the Bureau of Labor Statistics. This section includes information on the United States employment rate for September 2016. This report contains population, unemployment rate, and per capita income for Beaufort County for the month of October 2016. This section includes the commuting patterns for residents of Beaufort County. This report gives an update on companies within South Carolina as reported by the South Carolina Department of Commerce. This report contains population, unemployment rate, and per capita income for Beaufort County for the month of August 2016. This section includes information on the United States employment rate for August 2016. This section contains the Regional and State Employment and Unemployment Statistics for the month of July. This section includes information on the United States employment rate for July 2016. This section includes information on the United States employment rate for June 2016. This section contains the Regional and State Employment and Unemployment Statistics for the month of June. This report contains population, unemployment rate, and per capita income for Beaufort County for the month of July 2016. This report contains population, unemployment rate, and per capita income for Beaufort County for the month of June 2016. This section includes information related to the Regional and State Employment and Unemployment from the Bureau of Labor Statistics. This report contains population, unemployment rate, and per capita income for Beaufort County for the month of May 2016. This report contains population, unemployment rate, and per capita income for Beaufort County for the month of April 2016. This report contains population, unemployment rate, and per capita income for Beaufort County for the month of March 2016. This report contains population, unemployment rate, and per capita income for Beaufort County for the month of February 2016. This report contains population, unemployment rate, and per capita income for Beaufort County for the month of January 2016. 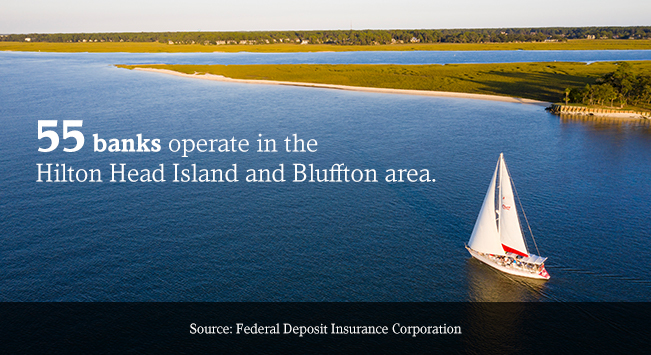 This section includes Bank Deposits for Bluffton and Hilton Head Island beginning in the fiscal year 2013 and concluding with fiscal year 2016. This information is updated annually. This section includes the presentation given at the November 2014 Bluffton Regional Business Council Luncheon. The speakers were Greg Kelly, Executive Director of the Savannah Airport Commission/Savannah Hilton Head International Airport and Allison Miquel, General Manager of JetBlue Airways Savannah. This section includes information related to the most current gasoline prices in South Carolina. This report was presented to the Government Affairs Committee in May of 2014 by Connect South Carolina. Connect SC was designated by the state to work with all broadband providers to create South Carolina’s first interactive map of broadband coverage. This report contains population, unemployment rate, and per capita income for Beaufort County for the month of June 2014. This section includes bank deposit figures for bank branches for Hilton Head Island and Bluffton beginning in fiscal year 2009 and concluding with the 2014 fiscal year. This is updated on an annual basis. The Cost of Living Index is updated three times a year providing city-to-city comparisons of key consumer costs by the Council for Community and Economic Research.